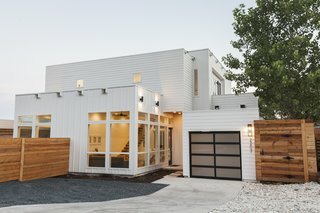 Patrice Rios, founder of interior design firm Troo Designs and custom shipping container business Sige&Honey, has combined her two loves in a new project in East Austin’s popular Mueller neighborhood. 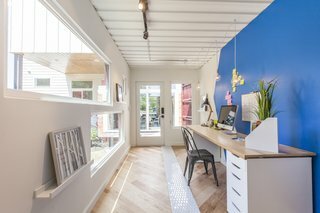 Designed with local architect Mark Reynolds, the duplex creatively reuses shipping containers as home additions that can serve as guest bedrooms, offices, or art studios. "The intent was to give the homeowner a place where they felt inspired to live and work," says Rios. 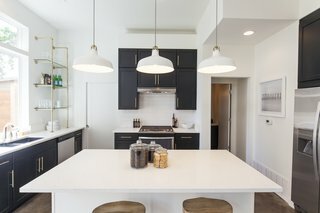 With one unit already sold, Unit B, which mirrors the same floor plan with more feminine finishes, is being offered for $499,000. A stained concrete floor gleams throughout the first floor. "The staircase is a real showstopper," says Rios, "connecting to the industrial steel of the containers, but warmed by wooden beams." Rios describes Unit B as the more feminine of the two units. Here, black and white cabinets feature a glint of brass hardware. Made of brass galvanized pipe and glass, the shelves by the kitchen sink combine aesthetics and function. 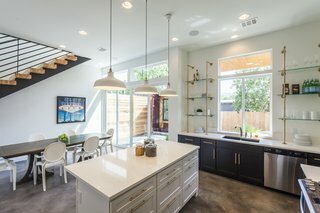 "I definitely wanted to give buyers a real sense of Austin," says Rios of the kitchen. "We have such beautiful restaurants and super unique design in our city. I feel like the shelving, high vent hood, gas stove, and double-stacked cabinets really expand on the volume of the home." In her discussions with Reynolds, Rios requested that the architecture of the building reflect the shipping containers in the backyard. 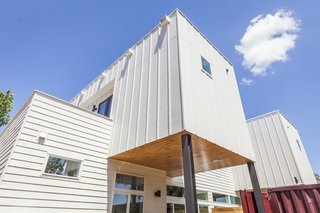 The modular appearance of the duplex, clad in white Hardie plank siding, mimics the look of a two-story container home. With large windows and 11-foot-tall ceilings, the two-bedroom, three-bath residence feels more spacious than its 1,484 square feet. On the ground floor, the living, dining, and kitchen areas flow into one another; potential guests in the shipping container also have easy access to a full bath of their own. A steel-and-wood floating staircase leads to the second floor, which holds two bedrooms with patio access. 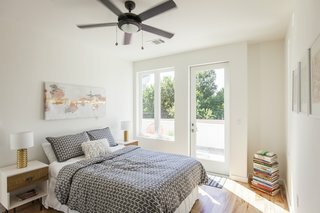 Both the master bedroom and second bedroom enjoy access to a private deck, perfect for reading, enjoying a cup of coffee, or simply lounging in the sun. 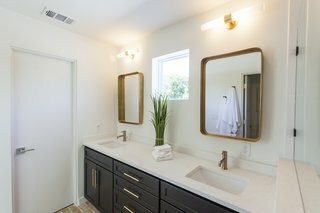 The master bathroom features brass mirrors, light fixtures, and hardware, taking visual cues from the brass accents found in the kitchen. Rios asked architect Reynolds to derive a design from the shipping containers. The duplex takes the shape of stacked volumes clad with vertical and horizontal Hardie boards. The covered patio features clear-coated cedar wood. 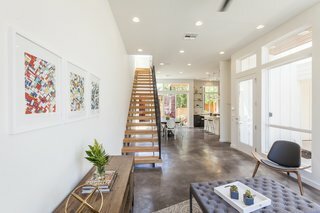 "This home brings a downtown high-rise feel with your own private work space and is literally steps away from one of the most popular neighborhoods in Austin," says Rios. "The east side is vibrant, funky, and very open to new concepts. There is no other place I would have rather built my first home including the shipping containers." The two units in the duplex share a wall in the main house, so Rios continued the mirrored effect by placing the shipping containers side by side about 10 feet away from the home. 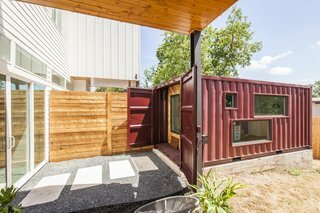 Cut into the sides, the windows allow natural light to illuminate the shipping container and are designed to give parents a view of the kids playing in the backyard. The front facade upcycles wood from the pallets used to ship in the cabinets. It's up to the homeowner to decide what to do with the additional 160 square feet; here, it's staged as an office. 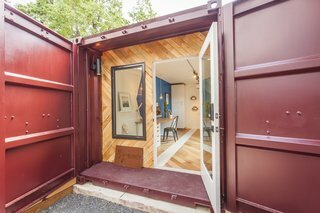 The shipping container features track lighting, wall sconces, a full-height cabinet to hang clothes, and a mini split air conditioner. The floors are a mix of engineered wood and hand-painted tile from Clay Imports. From inside the container, you can see through to the front of the house. For more information, visit the property website.